TORONTO – Hermie Garcia, editor and publisher of The Philippine Reporter, is one of the 13 recipients for the award for ‘Best Editorial and Visual Presentation,’ given by the National Ethnic Press and Media Council of Canada (NEPMCC), to outstanding members of this organization of over 400 ethnic media practitioners from all over the country. 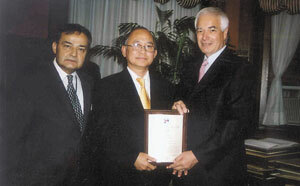 The award was formally conferred to Garcia by Prime Minister Stephen Harper during the gala dinner and award ceremony held last Saturday, Nov. 21, 2009 at Seneca College, in Markham, Ontario. The event was attended by various government ministers, president, members of the Board of Senators, and faculty of Seneca College, and some 170 participants in the 3-day 2009 NEPMCC Development Training Seminar and their guests. This is the fourth time in six years that Garcia has been accorded the award for “Best Editorial and Visual Presentation” by this prestigious national media organization of around 400 members, headed by Thomas S. Saras, NEPMCC president and CEO. The first award was conferred to Garcia in 2003, the second in 2005, and the third in 2008. At the gala night, from left: Hermie Garcia, Mila Astorga Garcia, NEPMCC President Thomas Saras, Vice President Asha Rajak and Zenaida Ferry Kharroubi of Filipino Star. Of the thirteen recipients, Garcia is one of only three awardees from Ontario, the others being from British Columbia, Manitoba, Saskatchewan, and Quebec. The other awardees are: Aaron Berhane, Editor-In-Chief “Meftih, News Paper”(Eritrean Ontario); Hassan Zerehi, Editor-In-Chief “Shahrvand” (Persian Canadian National) B.C. ; Luba Cherny, Publisher “Canadian Courier” (Russian Press and TV); Jaswinder Marjara, Publisher “CanIndia News” (Indian Press and TV); Arnold A. Auguste, Editor-In-Chief “Share, News Paper” (Caribbean Press and Radio); Thanh Quy Nguyen, Publisher “Vietnam Thoi Bao, Magazine”(Vietnamese Alberta); Mohammad Rahimian, Editor-In-Chief “Paivand, News Paper”(Iranian Quebec); Alhaji Saramady Kabba, Managing Editor “Canadian African, News Magazine” (African Alberta); Maura De Freitas, Publisher “The Celtic Connection” (Irish B.C. ); Mr. Rino Voltaggio, Publisher “Marco Polo” (Italian B.C. ); Yuling Wang, Reporter. “The Manitoba Chinese Tribune” (Chinese Manitoba); “Horizons” (Montreal) (Armenian Quebec). The award is especially meaningful to Garcia, as it caps a significant milestone year for the newspaper he had founded two decades ago with his wife and journalist colleague Mila Astorga-Garcia. This year, 2009, marks The Philippine Reporter’s 20th anniversary of publishing. It also marks the 40th year since the time the Garcias had started their professional journalism in the Philippines. Before the Garcias immigrated to Canada in 1984, Hermie Garcia was editorial writer for The Times Journal, a national daily newspaper in the Philippines. Before that, he was senior writer for the Observer magazine and desk editor at Times Mirror. Astorga-Garcia was a reporter and special projects writer covering the international affairs beat for Business Day, Southeast Asia’s first business daily. As managing editor of The Philippine Reporter, Astorga-Garcia was a recipient of the 2007 “Human Rights and Social Justice Award” from the NEPMCC, making the latest award conferred to The Philippine Reporter as the fifth overall that the paper has ever received from the NEPMCC. Last Saturday’s NEPMCC award ceremony was the first time ever officiated by the Prime Minister. The ceremony where Garcia had received his first award from the NEPMCC was officiated by the Minister of State for Multiculturalism, and the succeeding ones, by the Lieutenant Governor of Ontario. During the award ceremonies, Prime Minister Harper delivered his keynote address before the 170 ethinic journalists and their guests. “Today the ethnic press is no more merely an information disseminating medium but rather a powerful vehicle operating at the grassroots level. In the past, it had taken serious and active interest in fostering Canadian Unity and territorial integrity, and as pro-Canadian, it will pursue this goal vigorously in the future.” Saras said. Toronto MP Bob Rae (3rd from left) who spoke in the event, mingles with ethnic journalists in between the Saturday sessions. “While ethnic media and ethnic communities continue to participate fully in the nation-building processes, it is important to recognize their aspirations, dreams and concerns…the members of the ethnic press of Canada do not look for special status or treatment by the mainstream media, they would feel hurt if they are treated as second class citizens and negligible entity.” He continued. “Finally, it must be recognized that as long as immigration to this country continues, the importance and influence of the ethnic press will be more pronounced,’ Saras said. Among the guests at the gala event were: federal Ministers Jason Kenney and Peter Kent, Ministers Gerry Philips and Margaret Best of the Ontario Government, Mr. Tim Hudak, leader of the official opposition for Ontario, Mr. Dimitris Azemopoulos, Counsel General of Greece to Toronto, among other members of the diplomatic corps. Also present were the City of Toronto’s Rob Andrusevich, and officials and faculty of Seneca College. Other politicians who had graced the three day seminar and addressed the participants were: Bob Rae, MP, and Justin Trudeau, MP. TORONTO-The Philippine Reporter was awarded 2003 Best Editorial and Design by the National Ethnic Press and Media Council of Canada , during the Ethnomedia Week 2003 celebration held August 31, 2003, at Liberty Grand Building at the Canadian National Exhibition in Toronto. The paper was among 12 ethnic media organizations in the Press and Media category that were accorded prestigious honors by the Council-the only national ethnic press and media ethnic press and media organization in Canada-which was also celebrating its 26th year foundinganniversary. Other awards were given to three distinguished recipients in the Arts, five for Community Service, and 15 for Outstanding Achievement and Community Service. The formal award ceremony was attended by politicians in the three levels of government, officers and members of the Council and their families, and guests. The award was presented by Jean Augustine, Secretary of State (Multiculturalism) (Status of Women) and Thomas S. Saras, president of the Council, to Hermie Garcia, Editor-in-chief of the Philippine Reporter, and Mila Astorga-Garcia, Managing Editor. The plaque was accompanied with a Certificate of Recognition signed by Minister Augustine congratulating The Philippine Reporter and Garcia on receiving the award. The awards night was the highlight of the 2003 Ethnomedia Week held to honor the approximately four hundred ethnic newspapers and magazines all over Canada, serving more than twelve million people of various racial, cultural and ethnic backgrounds, who came from various parts of the world and made Canada their home. It was also a tribute to the memory of Zahra Kazemi, the Iranian-Canadian journalist, whose torture and killing in Iran has generated worldwide protests against human rights and press freedom violations. The Philippine Reporter , which is soon to mark its 15 years of continuous publication twice a month, was established in Toronto in March 1989, by Hermie and Mila Garcia, professional journalists from Manila, Philippines. Reporting events in the Philippines and in the growing local community, it covers hard news, features, political opinion, entertainment and the arts, sports, and community. “With its policy of Fair and Fearless Journalism, it has gained respect for its independence and courage to report on stories and issues other papers would rather ignore,” the publication notes. A sister publication, Planet Philippines, a global tabloid covering mainly Philippine entertainment and the arts, has also been published by the Garcias twice a month since December 2002. Other Press and Media 2003 Awardees are: Hadi Ebrahimi, editor and publisher of Shahrvand B.C. ; Rev. Monsignor Dr. Pranas Gaida, editor-in-chief of the Lithuanian-Canadian Weekly; Dominique Leval, journalist for the Express de Toronto and a regular writer for the francophone newspaper, Le Metropolitain; Jai Ojah-Maharaj, host producer of the Caribbean program at Chin fm 100.7 and am 1540 Toronto; Mitra Manesh, regular media commentator for the past five years at OMNI TV Channels; Tasos Milionis, former co-publisher of the Greek-Canadian Chronicles and presently publisher of the Greek Telephone Guide in Ontario, and recently the first Greek telephone directory in Canada; Antonio Rebeiro, publisher and founder of Correio Portugues; Burhaan Warsame, editor-in-chief of Gacal magazine, and Somali Voice community newspaper; Emmanuel Ayiku, editor and publisher of the Ghanaian News; Ahmadshah Hotaki, editor-in-chief of the Afghan Post; and Teshome Worldeamanuel, publisher and editor of TZTA, a Canadian-Ethiopian community newspaper. The Arts awardees included the internationally acclaimed and multi- awarded Greek-Canadian composer Christos Hatzis, whose works have been featured in many international festivals and whose music is played in major perfoming and broadcasting venues worldwide. Among those honored for outstanding achievement and community service was C. Kanta Arora, distinguished volunteer in the South Asian community as well as in mainstream charities, and TV Talk Show host at ATN-Asian Television Network (Asian Horizon, Jhankar) in Hindi language, where she provides vital outreach information for isolated women, seniors and newcomers. The Council counts among its member organizations 83 publications, among 244 national ethnic and media organizations it has accounted for and listed down in Canada’s Other Voices. 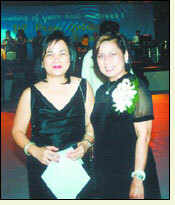 MANILA–The University of the Philippines Preparatory School celebrated its 50th anniversary in grand style January 3, 2004 in Manila. The celebration featured a nostalgic tour of the school’s former location at Rizal Hall on Padre Faura, and a gala night held at the NBC Tent, at the Fort’s Global City, in Taguig, Metro Manila. FILIPINO-CANADIAN AWARD-EES (from left) Mila Astorga-Garcia and Virginia Ugto-Alarcon. Two Filipino-Canadians were accorded special recognition during the prestigious school’s grand celebration: Toronto resident Mila Astorga-Garcia, co-publisher and managing editor of The Philippine Reporter, who was recipient of the Distinguished Alumnus Award in International Journalism; and Edmonton resident and former UP faculty member Virgina Ugto-Alarcon, vice principal of Dene Tha’ Community School in Chateh, Alberta, who received a special citation as the first Asian recipient of the Prime Minister’s award for education in Canada last year.Garcia, a U.P. Prep 1965 graduate, was one of 61 alumni selected by the 10-member panel of judges, chaired by Carmelita Caparros-Ramirez, and consisting of former faculty members of the UP, that had conducted the stringent evaluation. “The selection was based on the excellence and distinction you have achieved in your particular field of endeavor which has brought honor to the school and country, ” reads the letter sent to Garcia from the Awards Committee informing her of the award. UP PREP CLASS 65 — one of 20 classes that graduated from the prestigious high school posing for posterity at the gala celebration. UP Prep was a unique high school created in 1954, when the UP Board of Regents authorized then UP President Vidal Tan to open a first class high school in Manila. The school’s high standard curriculum was designed for grade school graduates with the aptitudes and intellectual talents for university level education. Only by passing a battery of rigorous examinations could a student get in, and once accepted, he or she had to hurdle to pass each of the four tough years of the highest standard of education ever given to high school students in the Philippines before one could graduate. In 1973, after graduating 20 classes — comprised altogether of 1500 graduates — UP Prep was merged with UP HIgh School to later become what is now known as UP Integrated High School. The gala celebration was attended attended by over 600 Prepians — many coming from various parts of the world. The evening’s program included dinner and dance; a well-applauded audio-visual presentation showing some of the best UP Prep memories; a very entertaining special number by comedienne Nanette Inventor, a 1969 graduate; a raffle; fellowship; and lively dancing which stretched to the wee hours of the next day, to the music of two of Manila’s tops bands,— Pryor Years Band by Mike Pedero, a UP Prep 67 graduate, and Willy Cruz’s band. The 50th anniversary activities, which took a year of preparation, were put together by no less than eight committees of UP Prep alumni and faculty, headed by executive committee chair Jejomar Binay, Makati Mayor and UP Prep 58 graduate, with Felipe Gozun (56) as vice chair; Tom Banguis (59), project director; Sylvia Amos-Lansang (59) and Daisy J. Serrano (59) as secretary. AWARDEE Hermie Garcia (center), publisher of The Philippine Reporter, receives plaque for Best Editorial and Visual Interpretation from Ontario Lieutenant Governor James K. Bartleman (right) and Thomas Saras, president of Naional Ethnic Press and Media Council of Canada. The Philippine Reporter was among 15 newspapers in Canada accorded prestigious honors by the Council – the only national ethnic press and media organization in the country. Other awards were also given to 30 individuals for their outstanding contributions in the field of the humanities, arts, letters, community service, industry, and science. The formal award ceremony which was hosted by the Hon. Bartleman, was attended by politicians including the Hon. Dalton McGuinty, Premier of Ontario; Hon. Michael Colle, Ontario’s Minister for Culture and Immigration; the Hon. Howard Hampton, MPP, leader of the Ontario NDP; the Hon. Jim Karygiannis, M.P. ; and the Hon. David Miller, Mayor of the City of Toronto. The Philippine Reporter‘s first NEPMCC award was presented during the Ethnomedia Week 2003 celebration at Liberty Grand Building at the Canadian National Exhibition in Toronto. This year’s awards was the highlight of the 2005 Ethnomedia Week held to honor the approximately four hundred ethnic newspapers and magazines and media organizations in Canada, serving more than 12 million people of various racial, cultural and ethnic backgrounds, who came from various parts of the world and made Canada their home. The Philippine Reporter, which is in its 17th year of continuous publication twice a month, was established in Toronto in March 1989, by Hermie and Mila Garcia, professional journalists from Manila, Philippines. Reporting events in the Philippines and in the growing local community, it covers hard news, features, political opinion, entertainment and the arts, sports and community. AWARD. Ontario ‘s Lieutenant Governor David C. Onley (right) confers the Human Rights/Social Justice Award to Mila Astorga-Garcia of Philippine Reporter. At left is Thomas Saras, president of National Ethnic Press and Media Council of Canada . TORONTO- The Philippine Reporter ‘s Mila Astorga-Garcia was honored with the Human Rights/Social Justice Award for 2007 by the National Ethnic Press and Media Council of Canada (NEPMCC), on the occasion of the annual Ethno Press and Media of Canada celebrations.The Honourable David C. Onley, Lieutenant Governor of Ontario, presented Garcia her award at the formal presentation ceremonies held Monday, Oct. 29, in the Lieutenant Governor’s Suite at Queen’s Park. The Lieutenant Governor was assisted by Thomas S. Saras, president of NEPMCC. Also honored at the award ceremonies were Toronto Mayor David Miller, and Don Wanagas, the City of Toronto ‘s Director for Communications, for their support of the ethnic press and media. Twelve other individuals of various cultural backgrounds from all over Canada were presented awards in the Individuals category, while a dozen publishers, editors-in-chief, directors and producers of electronic media were awarded in the Journalism category. Two were accorded lifetime achievements. Garcia was recognized for her work as a committed journalist, writing for The Philippine Reporter where she is managing editor; a researcher, and a community activist working on social justice issues in the Filipino and the greater ethnic community. Specifically cited was the recent research study she had authored, titled, “The Road to Empowerment in the Filipino Community: Moving from Crisis to Community Capacity Building ,” published by CERIS-The Ontario Metropolis Centre, in April 2007. This is the third time The Philippine Reporter was honored with prestigious awards by the NEPMCC. Before migrating with her family to Canada , Mila Astorga-Garcia was a reporter with Business Day (now Business World), Southeast Asia ‘s first business daily, covering the foreign affairs beat. She wrote for various national newspapers and magazines before that. She co-edited the books Filipina I and Filipina II, the first anthology of Filipino women’s writings in English, with writers Marra Pl. Lanot and Lilia Quindoza. At present, Garcia works as Research Analyst in the area of strategic social policy at the City of Toronto . She is also Research Director of the Community Alliance for Social Justice (CASJ), and is currently completing a CASJ collaborative research with Dr. Philip Kelly on labour market issues affecting the Filipino community in Canada . The first part of this research, titled, “The Deprofessionalized Filipino,” which tackled the lack of access to professions and trades by Philippine-trained Filipinos in Canada , was presented in a workshop at the 10th International Metropolis in October 2005 in Toronto . 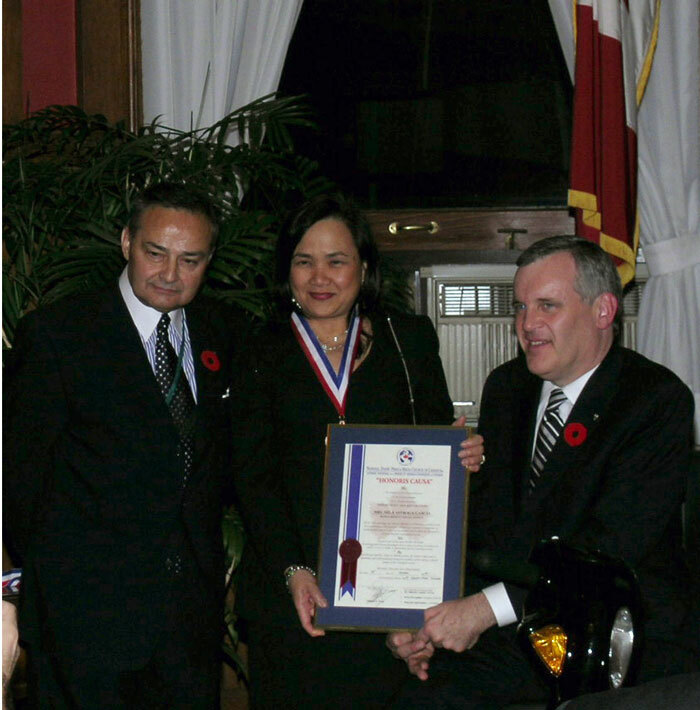 Hermie Garcia, Philippine Reporter editor, receives award from Ontario Lieutenant Governor, Hon. David C. Onley, at Queens Park on Oct. 30, 2008. TORONTO – The Philippine Reporter was awarded “Best in Editorial and Visual Presentation” for 2008, by the National Ethnic Press and Media Council of Canada (NEPMCC) last Thursday, Oct. 30 at Queens Park. This is the third time in five years that the paper received this award in the Newspaper category, from the prestigious national media organization that counts among its membership over 250 print, broadcast and electronic media establishments all over the country. The first award was in 2003 and the second in 2005. A fourth award in the Journalists category, the “Human Rights and Social Justice Award,” was conferred by the NEPMCC and Lt. Gov. Onley to The Philippine Reporter managing editor Mila Astorga-Garcia, in 2007. The 2008 award was presented to Hermie Garcia, publisher and editor of The Philippine Reporter, by the Hon. David C. Onley, Ontario Lieutenant Governor, and Thomas Saras, president of the NEPMCC during formal award ceremonies held at Queens Park. The Philippine Reporter was among 10 newspapers in Canada accorded the prestigious honors in 2008 by the NEMCC. Awards were also given to 14 other individuals for their outstanding contributions to humanities, arts, letters, science, industry and community services. The Philippine Reporter, which marks its 20th anniversary next year, was established in Toronto in March 1989 by Hermie and Mila Garcia, professional journalists who emigrated from Manila, Philippines. Reporting events in the Philippines, Canada and elsewhere, significant to the lives of Filipinos and other cultures, and the mainstream community, it publishes hard news, features, political opinion, entertainment and the arts, sports and community. It publishes both in print and electronic media, and its website, www.philippinereporter.com has generated a strong and steadily growing readership in Canada and around the world.